We’re going to start the journey with some clarification around the nature and strategic importance of the Service Portfolio. In reality the Service Portfolio is all of these and they work together forming an interconnected set of information used to manage service investments. Notice I said “service investments.” The Service Portfolio is primarily a capability to assess, plan and make investment decisions on what services to offer in a manner that allows you to sell those services to your customers. Yes, sell, because at the end of the day someone is paying for your services. Whether expressed explicitly or implicitly, the cost associated with providing service is real and your customers know it; you’ll be in a much better position if you can sell and articulate service value in the process. Understanding what you sell starts with the Service Portfolio capability. Service Taxonomy: This is where the organization of the portfolio begins. 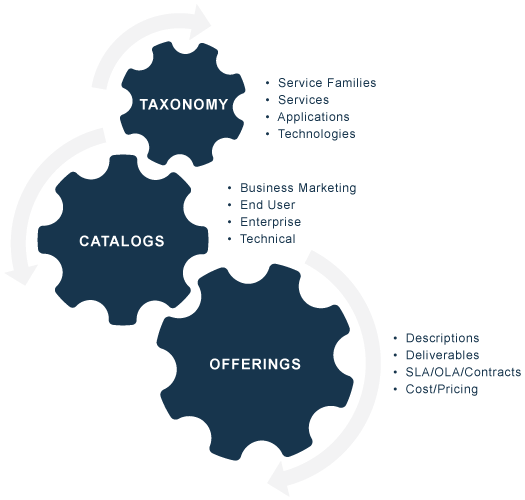 Organizing services into a set of service families for use in catalog navigation is fairly common and understood. However, there is other critical information and associations required like operational elements (a.k.a; dependency mapping) and cost model aspects (what’s delivered and how with associated costing linkage) that are less understood and more difficult to capture and structure as part of the taxonomy. Service Catalogs: There are different types of catalogs to support a variety of uses. For example; a marketing catalog (or sometimes delivered as marketing brochures) is used to describe your service offering in “customer” language and includes information about the value, cost and how to get the service. The end user catalog is typically focused on transactional request services that can be ordered by your end users and typically includes the aid of automation capabilities. Enterprise catalogs are set up to provide services to meet the needs of enterprise businesses and are managed independent of end-user services. Technical catalogs can also be request catalogs, but are typically reserved for internal teams to manage the delivery of underlying complexities of end user and enterprise services. Service Offerings: This is where you describe what you sell, what the level of service is (expectations), the method of delivery and what it’s going to cost. This is also where you relate the various elements of service deliverables together to fashion an end-to-end service (e.g. ; tying all the components, service elements and support aspects together that are necessary to deliver the service to your customer). Understanding the service end-to-end enables you to establish the true cost of the service. It is also important to note that your portfolio can have service offerings under consideration, those that are in operation and those that are retired. Financial Management for Services (cost models, transparency, budget planning, and chargebacks from a service perspective). More on this as part of this series of blogs. Configuration Management and CMDB (operational service impacts). For organizations that want to move from “order takers” to strategic partners, enabling a service portfolio capability is crucial. The key outcome of developing a Service Portfolio capability is to re-orient your business model to focus on services and delivering service value. This will lead to making better investment decisions. These decisions are based on understanding and managing your services based on what you sell in terms your customers understand. At our next stop we’ll drill a little deeper into these areas and look at a Service Portfolio model that will provide guidance on building a fully functioning services that you can use to show and sell value to your business partners and constituency.